Hello Fabricworms! 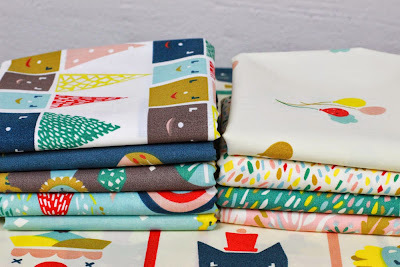 Its been a while since we gave away two free yards of fabric, so I am excited to say that for this week's giveaway we will be doing just that. Not only do you get to decide on what two fabrics you would like to receive, you get to decide from any of the Happy Town collection from Emily Isabella for Birch Organic Fabrics! Enter to win! This giveaway ends on Sunday 5/31 @ 12 am PST. The winner will be contacted shortly after by email. The winner will be chosen randomly by Gleam. Blues and purples are my fav! I would make lounge pants and my favourite colour is blue!! The happy colors & happy designs make me happy! Brite colors are fun! I would make a jacket for a little person. A snuggly quilt - blue! I love cream because it's so versatile. With two yards of fleece I would make a pull over for each of my youngest children for fall. HI,liking all the Blue shades to make a Snuggle Blanket! Anything pink to make a baby blanket! I am so excited! I hope I win so I can make a dress for my 3 month old baby girl! 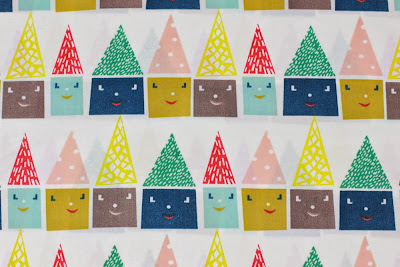 Happy trees, happy spots, happy houses - what can't you make out of these great fabrics!! 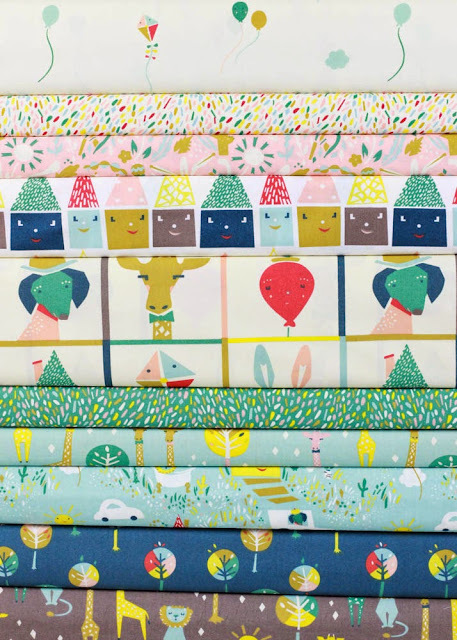 love the little dottie prints especially the green one. Love it. The fabric is sweet. Thanks for the chance. My favorite color of your organic fleece is sky and I'd make kids' pjs. Probably a throw and green would be my choice. Thanks for the chance to win. I love the happy houses and the lollipop trees! I like the design on the pink fabric. Oh gosh! What a great giveaway! Beautiful line. Organic fleece sounds like it would make a lovely snuggly quilt for my 2 yr old grandson. I'd create a lovely blanket for my sunroom. Coral is my favorite color fleece. am working on my niece's baby blanket... perfect timing! Adorable prints. Would love to win. Jammies for my kids would be fun! And I love anything blue! This is screaming 'pajamas' to me! Love the little houses/faces. I would use this for a great backing for a toddler blanket. Any teal color. Love those prints and the colors.!! I would make a baby blanket. I love sky blue or turquoise. I would make little girl's purses and maybe pillows with these. So cute! I would love to make a cute summer outfit for my toddler. Turquoise is my fav! 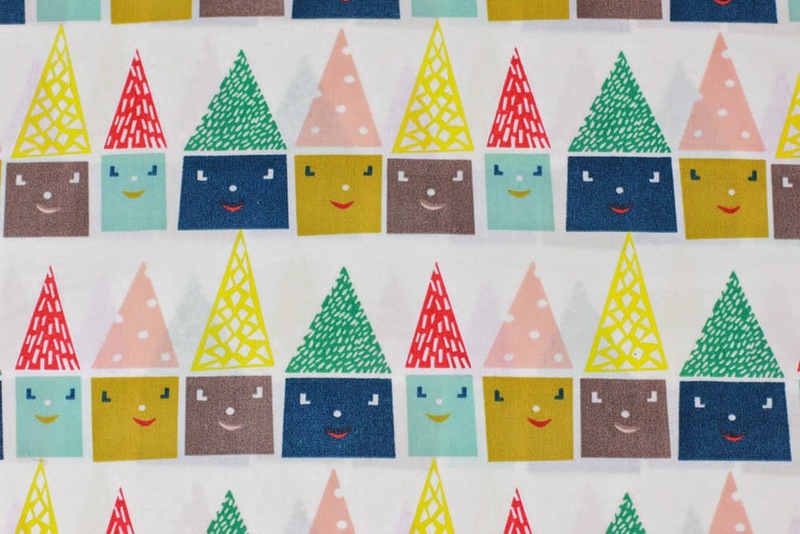 This fabric is so adorable. I'm making some burp cloths and this would be ideal! I have a 13 day old granddaughter that I could make so many cute outfits for from these cute fabrics. Hope I win. 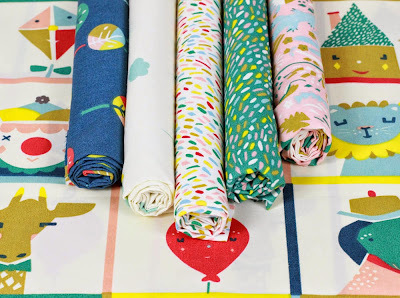 I can't wait to make an adorable set of nursery sheets and a quilt for my little one! I would make a quilt for my baby! Oh these prints are so cute! I would definitely make a shirt for my little boy! I would use it as backing on a baby quilt. I love aqua. I would definitely make some fun purses with these beautiful colors! I have 5 grandkids so 2 yards would certainly end up in a gift or two for one or more of them. This collection is ridiculously cute!!! I'm thinking car seat cover! I'd make a quilt top for charity, World of Charity Stitching. What cheery fabrics. Would make some cute bags or pillow cases for the kids! Well, my niece is expecting her first baby, so I'd probably make a quilt. My favorite color right now is probably aqua/teal-ish because it plays so nicely with many other colors. I love the greenish teal color in the stack of fabrics, and I'd use it as a blanket backing. Love the giraffe fabric with bright yellows! I would make a baby blanket for my little one! I'm in love! Perfect fabrics for cute and kicky bags of all shapes and sizes! Oh my, this is so damn cute... I'd love to do summer Pj for my kids in that ! We're expecting a new nephew, so I'd likely make a receiving blanket out of this darling fabric. This fabric would make the cutest dress for my daughter! This would be so sweet to make a quilt for my grand nephew!